Lie face up with your hands between your low back and the mat. 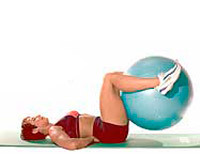 Bent your legs to 90 degrees and hold Swiss Exercise Ball between feet. With control, lift tailbone off mat, bringing pelvis toward ribcage. Release and repeat.